Feng Shui was first developed in China over five thousand years ago. And while the core principle of Feng Shui remains true -- that manipulating your environment can result in health, wealth and prosperity -- westerners have adapted some of its rules to reflect their own sensibilities. Fortunately, there's no need to be absolute when it comes to Feng Shui. Like a Chinese menu, you can pick some things from Column A and others from Column B to create the most desired outcome. Remember: Feng Shui is all about flexibility! East -- The meaning of colors varies greatly from culture to culture. 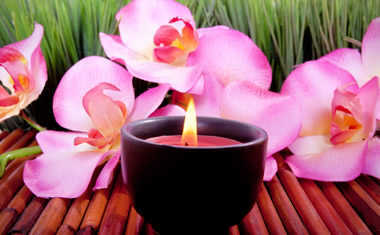 Therefore, Eastern Feng Shui practitioners prescribe different color cures than their western counterparts. In China, the color white is associated with death. Conversely, black is the color of money. Red is the color of ceremony, and considered very auspicious -- bridal gowns are typically red in China. Blue is linked to both mourning and hope in the East. Yellow symbolized authority to the ancient Chinese; this color was reserved for the Emperor. West -- Westerners associate the color white with purity (think bridal gowns and cowboy hats). Black, on the other hand, symbolizes death, evil and mystery (think funerals and cowboy hats). The strength of the US dollar has made green the color of money, while red connotes passion, excitement and anger. Blue symbolizes rest and relaxation . Purple is associated with both royalty and spirituality, while yellow is linked to clarity and optimism. One -- Sounds like the Chinese word for "honor;" conveys stillness, independence. Two -- Sounds like the Chinese word for "sure." Symbolizes the quality of symmetry, as well as steadfastness. Three -- Sounds like the Cantonese word for "growth" and represents abundance. Four -- Sounds like the Chinese word for "death" and represents misfortune. Five -- Represents balance because of its association with the Five Elements. Six -- Sounds like the Chinese word for "wealth" and conveys affluence. Seven -- Sounds like the Cantonese dialect's word for "sure" and symbolizes effortless happiness. Eight -- Sounds like the Chinese word for "multiply" and symbolizes fertility. Nine -- Sounds like the Chinese word for "longevity" and promotes a sense of personal fulfillment or completion. One -- Represents independence, but can lead to isolation. Two -- Symbolizes partnership, but can result in co-dependence. Three -- Conveys enthusiasm, but can turn to impatience. Four -- Represents stability, but can lead to stubbornness. Five -- Symbolizes excitement, but can result in restlessness. Six -- Conveys nurturing, but can turn to martyrdom. Seven -- Represents spirituality, but can lead to pessimism in the material world. Eight -- Symbolizes ambition, but can result in insensitivity. Nine -- Conveys humanitarian ideals, but can turn to selfishness. East -- The first Feng Shui practitioners placed great importance on the compass direction of a property. Before electricity, the quality of sunlight that a place received had a tremendous influence on people's livelihoods. Compass directions continue to play an important role in Eastern Feng Shui, and are often the guiding principle behind its cures. West -- Technological advancements have changed the way people lead their lives. People who live in industrialized countries have far more flexibility when it comes to choosing a place to live, because their livelihoods don't depend as much on the Sun or the seasons. Therefore, modern Feng Shui practitioners use the front door as the point of reference for cures. East -- Eastern Feng Shui originated in a time of strict social order. The roles of fathers, mothers and children were clear and indisputable. Therefore, Eastern Feng Shui practitioners believe there is a prescribed position for each member of the household, based on their gender and birth position. For instance, they believe that the master bedroom should always be located at the back of the house, to confer honor and protection to the most important members of the household. 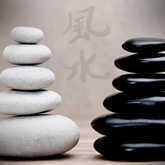 West -- Western Feng Shui practitioners come from a more fluid society. Fathers aren't automatically the sole bread-winners, and mothers don't necessarily play the nurturing role in families. Children's needs are assessed in terms of their personalities, rather than by their birth order. Therefore, Western Feng Shui practitioners take into account the emotional as well as the physical landscape of a home before prescribing cures. East -- The first Feng Shui cures were developed in accordance with eastern sensibilities. Symbols like the tortoise, bamboo flutes, fans and firecrackers are used to alter the energy in a given place. While these symbols remain powerful to people in eastern cultures, they don't resonate the same for westerners. West -- Symbols in western culture tend to be highly personal. A flag that conveys pride to one person could be experienced as offensive to another. Instead of offering blanket cures from the outset, Western Feng Shui practitioners prescribe symbolic remedies after interviewing their clients. Even generic cures are different in the West. For example, if you live in the United States, the image of a $100 bill will resonate with you more strongly than a long string of Chinese coins. East -- The first toilet facilities were functional -- their sole purpose was for the disposal of waste. As a general rule, they were dark, dirty, smelly places that did not emit positive energy. That's why traditional Feng Shui practitioners view the bathroom as a negative influence, and often prescribe elaborate cures to minimize the bad chi associated with this space. West -- With the advent of modern plumbing, bathrooms became more than just a place of private convenience -- they became centers of self-care. A luxurious bathroom can even double as a personal spa, complete with hot tub, steam shower and towel warmer. It is true that Western Feng Shui practitioners still acknowledge the dissipating influence of bathrooms, because valuable energy can escape the house through toilets and drains. However, these problems can be easily remedied by putting the toilet lid down and closing the drains when they are not in use. By taking these simple precautions, a nice bathroom can actually attract luck, rather than drive it away or allow it to flee.